As the popularity of Sprinter vans has increased so markedly in North America over the past years, Daimler Trucks is taking the next logical step and bringing production of the vehicles to this side of the Atlantic. 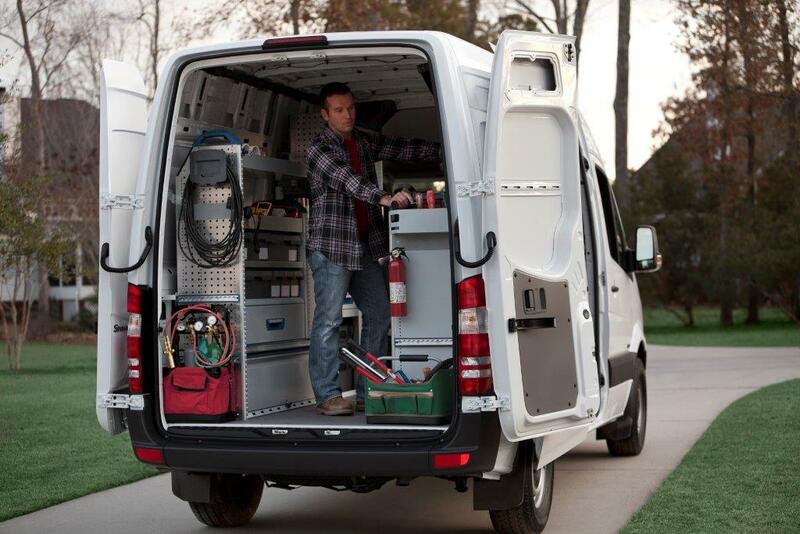 While the German-based unit will still produce Sprinter vans as before, the new North American production is expected to make these highly useful vehicles much more accessible to U.S. customers, which is good news for domestic fleet owners and drivers alike. Read on to find out more about Sprinter vans’ journey to North America! The head of Mercedes-Benz Vans, the makers of Sprinter, acknowledged that the only way to adequately meet the needs of their North American customers was by adding a production plant within their own country. When Sprinter vans were being shipped over from Germany (at a staggering 23,000 just last year), there were definite downsides: longer delivery times, for one, and increased prices due to import tariffs for another. 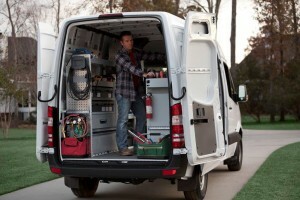 But with a home-grown Sprinter van, fleet owners will no longer have to worry about those inconveniences. While the demand for Sprinter vans and similar Daimler vehicles continues to grow stateside, solutions like bringing production to North America will become more and more necessary. Daimler’s decision benefits everyone involved: the company will be able to produce their vans without the headache of facing taxes and extended delivery periods, and customers will have easier, more efficient access to their favorite products. In last week’s blog, we discussed the latest announcements from Daimler Trucks North America, specifically those concerning the new safety package, the “Detroit Assurance Package,” and how its collision and lane departure alerts are set to revolutionize the way drivers operate their vehicles. But what do the drivers themselves have to say about integrated safety systems? If the research from a University of Michigan study has anything to say about it, they fully approve! In the study conducted by the UMTRI, which was a comprehensive 5-year research program, the compiled data generally had positive things to say about the overall effectiveness and usefulness of integrated safety systems in trucks. They were proven to reduce the number of accidents experienced, and the drivers who participated performed at a safer level with the help of the integrated systems. Dave LeBlanc, one of the chief investigators of the UMTRI project, noted that the results of the study brought these systems to the attention of some big names. At the conclusion of the study, he notes, Con-way ordered a whopping 1,300 Freightliner Cascadias (the models including lane departure and forward-crash warnings and roll-stability control systems) to add to their fleet. If more follow in their footsteps, these safer vehicles could change commercial trucking for the better well into the future! 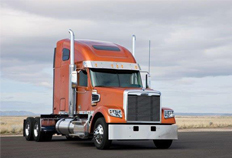 Check back with Baltimore Freightliner-Western Star for the latest updates on truck safety and other trucking news! Daimler Trucks North America took the opportunity on October 6 at the American Trucking Associations’ Management Conference & Exhibition to share their latest news on trucking innovations: a new safety system package, as well as Detroit-branded medium-duty engines. As the industry continues to experience steady growth, these latest additions from DTNA just go to show the reason behind improving sales and company success: they are innovations that take into account the needs of fleet owners and truck drivers alike to make for an overall more effective experience. Read on to find out more! The new safety system announced by DTNA has been dubbed the “Detroit Assurance Package;” it offers a number of features that are designed to improve overall driving safety. The package includes a radar system to alert the driver about possible collisions, an adaptive cruise control option, as well as a camera system to monitor lane departures. This new system allows the driver to improve their performance, and it also improves the overall performance of the vehicle itself. 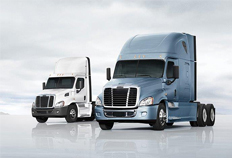 So far, the Detroit Assurance Package is available in both the Freightliner Cascadia Evolution model and the Cascadia, along with the new medium-duty engines. The new medium-duty engines, the DD5 and the DD8, will be offered starting in 2016. Not only are they designed for high-quality performance, but they are also considered to be eco-friendly engines; according to DTNA’s president, the engines will meet the regulations for greenhouse gas emissions projected to be in place for 2017. Fresh off the heels of Western Star’s new truck launch comes the debut of a Daimler truck vehicle that those in the industry are referring to as a “work of art.” The Future Truck 2025 was revealed in Germany over the summer, according to an article in the latest edition of Transport Topics, and its advanced technology and revolutionary design are garnering a lot of attention already. What features in particular have got people talking? Read on to find out! 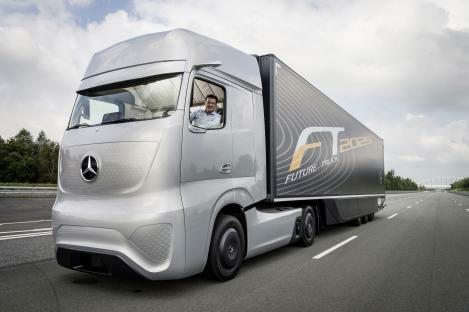 The Future Truck 2025 is the first self-driving truck from Mercedes-Benz; its autonomous function utilizes cameras and specialized sensors to allow the truck to navigate safely around other vehicles and obstacles, even at highway speeds. Radar sensors are also incorporated to alert drivers about dangers in their blind spots, making for an overall safer truck. The look of the Future Truck 2025 is downright, well, futuristic. Instead of traditional rearview mirrors, the truck features a video camera system that provides advanced, comprehensive visuals. Taking out the mirrors also yielded an improvement in fuel efficiency. Subtle differences in the design have made a remarkable difference as well, such as the placement of the headlights; the Future Truck’s are placed under the hood so that the lights shine through the paint. The “smart” lights even shine in different colors to indicate what mode the truck is in: white for manual driving and blue for autonomous. Want to stay up-to-date on the latest in trucking news? 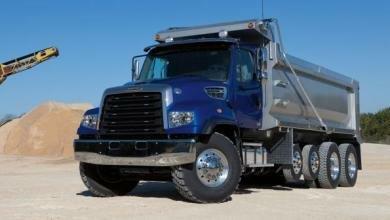 Check back with Baltimore Freightliner-Western Star to hear all of the latest!